Submitted 15 grant proposals to various agencies, such as NIH, DOD, and Bial Foundation, Uberoi Foundation, Government of India. Published 15 articles in peer reviewed international journals/books, and 12 popular articles . 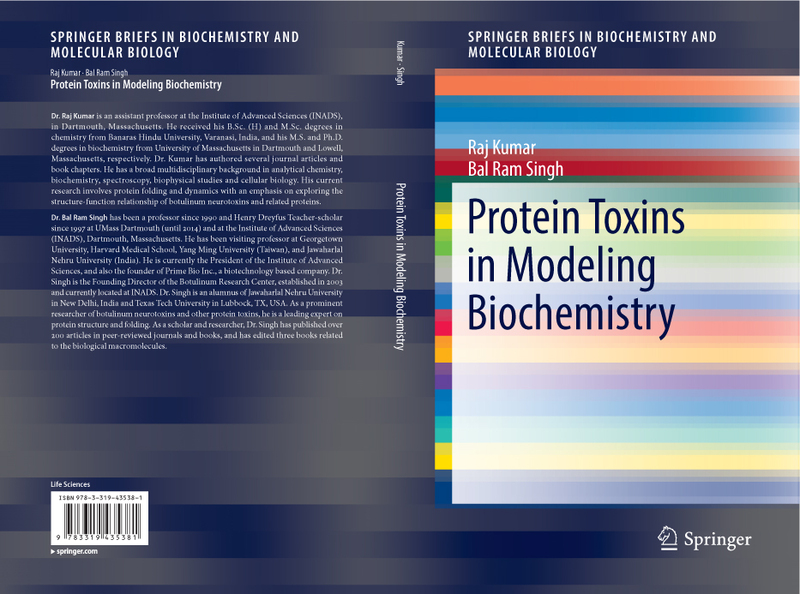 Published 1 book, Protein Toxins as Model for Biochemistry, Springer. Thirty conference presentations at several national and international symposia and conferences. Twelve poster presentations at various international symposia and conferences. Organizer/Coordinator/Chair at over dozen conference/Symposium. Served on panel discussions and expert panels at Harvard Medical School, BioScience Review Conference, World Association of Vedic Studies Conference; World Ramayan Conference, India, Avadhi Ramayan Conference, Fall River, MA. Presented over a dozen seminars, workshops, and training sessions. A presentation entitled "Hindu Voice in Modern Academic World The SWOT Analysis, Vishwa Sangh Shivir, January 2, 2016. A presentation entitled "Scientific Tenor in Indian Traditions" at Amity University, January 13, 2016. A seminar presentation entitled "Scientific Lens on Sanskrit Knowledge for Socio-political and Environmental Issues" at Kamla Nehru College, Delhi University, March 10, 2016. Distinguished seminar presentation entitled "Sanskrit and Science" at Sanchi University of Buddhist and Indic Studies, Bhopal. March 15, 2016. A seminar presentation entitled "Changing Landscape of Media and Socio-Political Transforation in India" Makhanlal Chaturvedi National University of Journalism, Bhopal, India. March 16, 2016. A seminar presentation entitled "Socio-Political Concepts from Vedanta – Fresh Observations from India" at the Institute of Advanced Sciences, Dartmouth, MA. April 19, 2016. A presentation entitled "Ancient Indian Tradition of Science: Ayurveda – the Science of Life" at the Uberoi Foundation Teacher Training program, Denver, Co. June 1, 2016. A presentation entitled "Avadhi Ramayan and the Eternal Traditions of India" at the symposium of ABHAS Foundation, June 18, 2016. A presentation entitled "Strategies and Steps for Advancing Ayurveda/Yoga for Healthcare" at the symposium on Integrative Medicine – Role of Yoga and Ayurveda. Harvard Medical School, June 29, 2016. A presentation entitled "Introduction to Modern History Geography of India", Uberoi Teacher Training India program, Jawaharlal Nehru University, July 11, 2016. A presentation entitled "Avadhi Bhasa – a case for the national language status", ABHAS Foundation Workshop, India Habitat Center, Delhi, August 6, 2016. A presentation entitled "How to plan for next generation to learn VEDIC HERITAGE AND PREPARE NEW FLAG BEARERS", at Greater Atlanta Vedic Temple, October 23, 2016. A presentation entitled "How to Rescue Gandhi from Gandhians and Anti-Gandhians of Today", Hindu University of America. November 3, 2016. A presentation entitled "Thou Sword Turned into a Plowshare" Bridgewater-Raynham Regional High School, Bridgewater, MA. November 3, 2016. A presentation entitled "Performing Science with Closed Eyes - Science of Yoga", Bridgewater-Raynham Regional High School, Bridgewater, MA. November 3, 2016. A presentation entitled "Neurological link between Diet and Mind", Fall River, MA, February 12, 2016. A presentation entitled "Unique Structural and Functional Features of Botulinum Toxin". Amity University, Gurgaon, India, 2nd May, 2016. Served on Board of Directors of World Association of Vedic Studies, consultant to the Board of Trustees of the Uberoi Foundation, Board of Directors of Education Society for the Heritage of India, Board of Directors of International Accreditation Council for Dharma Schools and Colleges (IACDSC), Board Trustees of Maryada Foundation, Board of Directors of Antarrashtriya Avadhi Bhasa Samiti (ABHAS) Foundation, Board of Directors of Kuruom Foundation. Served as Editor-in-Chief/Editor/Associate Editor/Managing Editor for Biochemical and Biophysical Research Reports, International Journal of Indian Culture and Business Management, Ayurveda Journal of Health, and Vedic WAVES Blogs. Recognized reviewers of Peptides, Biochemical and Biophysical Research Reports, Journal of Biochemical and Molecular Toxicology, Toxicon, Analytical Chemistry, Cellular Microbiology, Toxins, etc. Appeared on Doordarshan International TV program in India – Sanskrit Vartavali, December 15, 2016. Completed four research projects related to inhibitor design, detection, vaccine, in vivo imaging and trafficking. Six in-house projects are in continuation. Filed for three US Patents. Completed summer internship program of INADS for high school and college students. Organized 3 week long Uberoi Teacher Training India Program, 2016. Organized Xth Botulinum Research Symposium, 2016. Organized WAVES Conference, 2016 in collaboration with Bhartiya Vidya Bhavan, India.